Since our site went on-line in 1999 we have received hundreds of reviews, many of which are now included on our site. However, there are far too many to put in one place. Below is some of what our customers have said about us. For reviews of a specific product navigate to its page and scroll to the bottom of the screen. You can also switch between product testimonials and customer service testimonials using the tabs below. Not all products have received reviews. 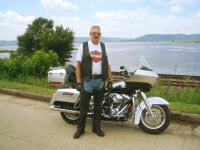 Last fall I ordered a pair of custom chaps and used them many times in the Minnesota weather. Recently, four of us made a 3000 mile trip through Kansas to Colorado, up the mountains to Yellowstone and back through the Black Hills. It was beautiful. All three of the other guys had chaps with exposed silver zippers and they all failed. They were holding them on with bungee cords, bandannas, and Velcro straps by the end of the trip. Mine performed flawlessly. When you need them, the quality had better be there, and yours was. When leaving Jackson Hole at 38 degrees, they would have happily paid another $30-$40 for chaps that would stay together. Thanks for making a great product. When they wear out, I'll order another pair. Taken from Vic's post on www.sportster.org. Since Colorado Jeff mentioned his new jacket, I thought I'd do the same. A while ago, I asked the list if anyone had any experience with Fox Creek Leather products. A few people responded positively, nobody negatively. I finally got around to ordering a jacket, and it arrived last week. I have to tell you, IT IS AWESOME! The weight, thickness of leather, and quality of workmanship and detail look to me to be about the same level as Vanson, but at about 1/2 the price. The jacket I got is a classic biker style jacket. It has both a removable thermal liner and zippered vents, front and back, to make it extremely versatile. It is similar to, but seems to be of higher quality than, the H-D El Camino jacket, at about $100 less than the H-D. You can get their products in a wide variety of colors and finishes. I got basic black. A nice plus is that it is made right here in the good old US of A. And at about $300, it is a bargain and better quality than I have seen at just about any price. Also, customer service and responsiveness are excellent. Of course, how it holds up over time will be the real test, but right now it looks like a definite winner. No affiliation, yadda yadda yadda.